These crochet wrist cuffs have a Victorian feel that will dress up a variety of outfits! 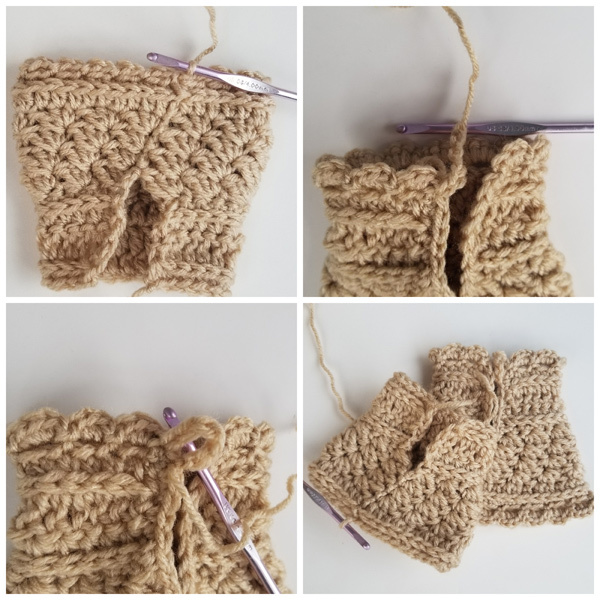 I have been excited to try crocheting “wristers” (also known as wrist warmers) for a while, and have been looking for the perfect opportunity to make a set. 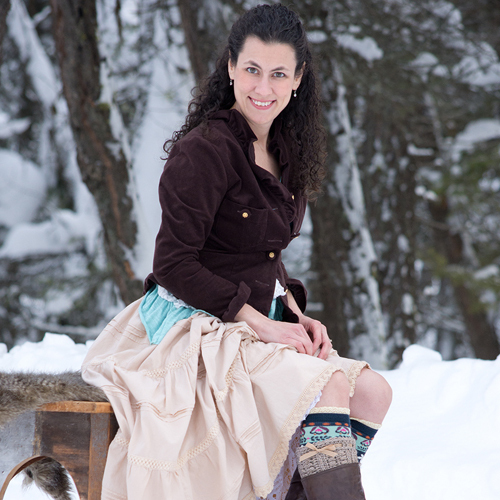 Several of you have mentioned wanting a pair of fingerless gloves to go with the Ribbons and Grace Bootcuffs, Neck warmer, or Ribbons and Grace Headband, but due to the way the pattern spirals, a straight thumb hole would have been somewhat tricky to pull off. These pretty crochet cuffs solve that problem nicely since they lack a thumb hole. 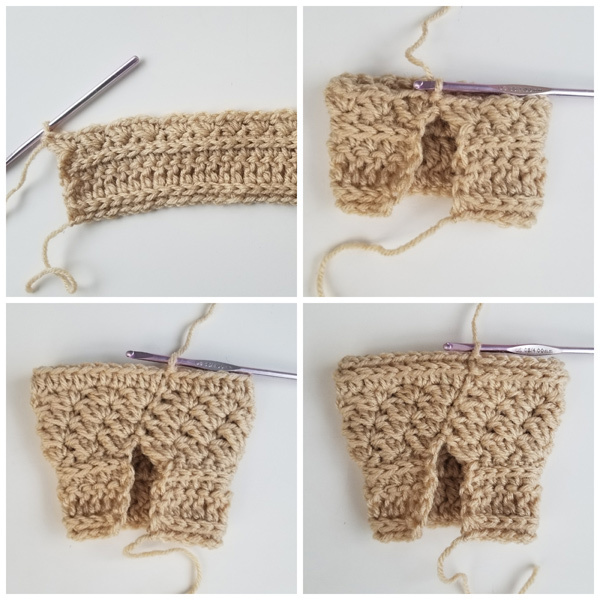 I’ve included only one size because the pattern has a good amount of stretch to it, however, if your wrists run very large, you may want to go up a hook size when working the first 4 rows. My wrists are very tiny, and these are slightly loose. Keep scrolling down for the free wrister pattern! 4 1/4″ tall, by 3 1/2″ wide at the narrowest point. -If these are too short, feel free to add another repeat of round 6. If they are too small, in the opening, go up a hook size; too large, go down a hook size. -It is possible to add a thumb hole of sorts by putting a stitch at the end about 1″ from the edge. -These cuffs are worked in multiples of 6. When you complete round 2, sl st into first sc that was worked down the side of the opening (in round 1), ch 6, sl st into the next sc, creating a button loop. After getting to the end of round 2 on the top part of the cuff, fasten off, and weave in ends. Attach yarn to first sc at opposite side of wrister opening. Ch 6, sl st into next sc creating a button loop. Sew a small button on the back of the wrister, opposite the button loop. Cut two lengths of ribbon for each wrister. One 15” and one 20”. Using sewing needle and thread, sew ribbon (or use hot glue) to itself to secure one end of ribbon near the back openings of the wrister. Weave ribbons through row 2, and tie in a bow, to one side of the cuff. Tie into a bow, and trim the ends as short as you’d like them. Coat the ends of the ribbons with fray check or clear nail polish. This is how rows 1-5 will look just before you join round 5, and after you join round 5. Once you are done with doing the shells in rounds 6-8, you will add a round of hdc (round 9), then in round 10 you will work single crochets in the 3rd loop of the hdc from the previous round. This will great a ridge. Once you have finished round 10, you will chain 2, skip a stitch, and slip stitch into the next, all along the bottom. Then work the shells from the final round in those chain-2 spaces. Fasten off. Do the same thing on the top of the cuff, but once you get to the opening, single crochet down the opening and back up. Then, start the the next round (shells). After you have completed the shells, make a button loop by chaining 6, and slip stitch into the single crochet right near the base of the chain. Fasten off and weave in ends. You are welcome to share the link to this pattern, using one image of your choice, on your site, but please do not share the written patterns themselves, or use additional images. If you sell finished items online, please do not use my pictures for your listings. I’m positive that your work is of high enough quality for you to sell the finished piece. Thank you! In row 6-8 after the chain 1 does the next stitch go into the same stitch or the next one ? Love love all your tutorials. It will go in the same stitch as the join. 🙂 You seam will slant a bit.